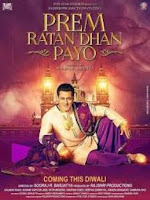 Prem Ratan Dhan Payo song lyrics in Hindi from the movie Prem Ratan Dhan Payo. Prem Ratan Dhan Payo picture was directed by Suraj Barjatya . The starrers of the film are Salman Khan, Sonam Kapoor, Anupam Kher etc. Prem Leela Hindi song was penned by Irshad Kamil. and sung by Palak Muchchal . The music was composed by Himesh Reshammiya. प्रेम रतन धन पायो मैंने ..
प्रेम रतन धन पायो ..